Despite what you might want or think, riding a motorcycle during every waking moment of your life simply isn’t practical. Besides the need to sleep, eat and go to work, there are other times when riding simply isn’t possible, or even safe. Riding in inclement weather, although possible is not always advisable, and it certainly presents some hazards that make it less than enjoyable. So what do you do when the idea of riding motorcycle on your biker date isn’t something that is feasible? Sure you could ride out to a movie or a dinner date, something that nearly everyone has done at one time or another. Another option is to ride out and have a relaxing date at a coffeehouse. But you’re different, and you know that your biker dating would be positively bored with either of these choices. You want something a little more unique, a little bit more exciting than your standard date fare. So what should you do? 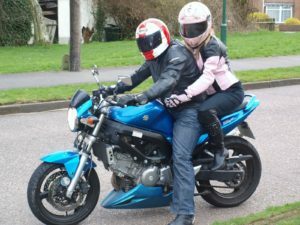 How can you have a good time, and make your motorcycle date memorable? Ride out with your biker lover for movie theme at night. If you think about it, one of the most enjoyable things that you can do when it’s cold and rainy outside is to snuggle up on the couch, pop some popcorn, and watch a movie or two. Why not have you and your biker babe or biker boy make a theme night of it? On your way home stop by the video rental store, and see if you can find a few movies that share a common theme. Sure, you can do the normal things such as a horror movie theme night, or a comedy theme night, but it is also fun to make a bit of a game out of it. Start by each of you picking out two movies-each with a common element or heme. It can be anything from the movies being produced by the same person, or having a common supporting actor. It could even be something easy like they have the same overall theme. But whatever you choose, your biker lover while watching the films has to guess what the common element is. If you win, they owe you a nice dinner out. If you lose, well, you owe them the same. Half the fun is trying to figure out what exactly the theme. The other half is snuggling beneath the blanket and sharing a big bowl of popcorn. Another game that can be a lot of fun while you’re watching movies is to have a contest to see who can find the most items in the movies. This game is often coupled with drinking, but there is no reason why the contest can’t be done with other things, such as popcorn or movie theater candy. Start by deciding ahead of time what objects, or words that you each will be looking for. This game is best when it’s a movie that neither one of you and your biker match have seen; it’s no fun if you’re able to “cheat” by knowing what is in the next scene before your date does. As for the objects you choose, it really can be anything. It could be how many times a character says the word “no” or “eyes” or perhaps every time a gun clip is emptied- or if you’re really paying attention, how many times the gun seems to have unlimited ammo. Keep track of who points out the most items, and the winnings could include a nice ride up into the mountains on the next bright spring day. If contests aren’t your thing, but you still want to have some fun while you enjoy your movie night, another option is to help the movie along by providing your own dialogue. Turn on the movie, mute the sound, and try to provide the dialogue, sound effects and even the musical score of the movie if you’re so inclined. This game works very well with movies that are new to you, and half the fun is comparing what you had to say with the real dialogue when you finally watch the movie with the sound on.